Frostburg State University’s departments of Visual Arts and Sociology will host a lecture, “Science and Technology to Leverage Culture and Cultural Heritage,” by Dr. Yasser Elshayeb, a professor of engineering at Egypt’s Cairo University, on Thursday, Sept. 27, from 7 to 9 p.m. in FSU’s Fine Arts Building room 118. This event is free and open to the public. In addition to his work at Cairo University, Elshayeb is also the national coordinator for the Erasmus+ Programme of the European Union. He is active in the field of cultural heritage management and conservation, risk assessment and project management through the participation and management of several international projects in those fields. Since 2006, Elshayeb has been involved in setting up the Euro-Mediterranean policies and dialogues on higher education, research, innovation and culture as a focal point of many Euro-Mediterranean programs in Egypt. 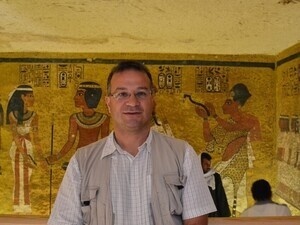 For many years, he was the Egyptian national contact point for European research programs and participated in many projects focusing on setting priorities in the Mediterranean region, the Gulf region and Africa. This public lecture is co-sponsored by World Artists Experiences. For more information, contact Dustin Davis at ddavis@frostburg.edu or Dr. Kara Rogers Thomas at krogersthomas@frostburg.edu.